For decades, Israel has failed to uphold its duties as Occupying Power and has instead deepened its occupation and regime of colonialism and apartheid. Human rights violations rising to the level of international crimes, including unlawful killings, torture, forced transfer, and other forms of collective punishment have become the norm. Rather than uphold their responsibilities under international law and take measures to hold Israel accountable, third states have largely turned a blind eye. Although world governments and international and regional bodies, like the United Nations and the European Union, still lack the political will to hold Israel accountable, the Boycott, Divestment, and Sanctions (BDS) movement has grown to provide an important nonviolent counter-narrative and alternative for achieving the enjoyment and exercise of freedom, dignity, and justice for Palestinians. The 2005 BDS call, issued by Palestinian civil society, and the Palestinian BDS National Committee (BNC), which leads the global movement, both affirm that BDS is inclusive, rejects all forms of racism and discrimination, and does not target any person or entity based on their respective identity. Rather, the movement targets Israel’s occupation and oppression of Palestinians. Corporations and institutions that aid, abet, or profit from Israel’s denial of Palestinian rights also fall within the purview of the movement. As the impact of BDS grows, so too do efforts by Israel, its lobby groups, and supporters to vilify, smear, and attempt to criminalize the movement. Many attempst to falsely associate the nonviolent movement with discrimination or anti-Semitism; such claims are not only baseless, but also unjustly trample on the rights to freedom of expression and protest, amongst others. 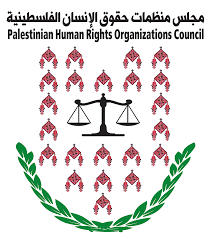 Accordingly, it has become imperative for the Palestinian Human Rights Organizations Council (PHROC) to reiterate the universality of these human rights. PHROC affirms the right of all individuals to participate in and advocate for boycott, divestment, and sanction actions, and calls on states and businesses to uphold their related legal responsibilities. PHROC reminds states, including their legislatures, that many members of the international community have had experiences with boycott, divestment, and sanction measures in the development of their own political systems and have also participated in such measures via the United Nations. BDS actions against apartheid South Africa are perhaps amongst the most memorable and prominent. PHROC stresses that repressive attacks against and attempts to criminalize the BDS movement are similar in nature to assaults against human rights defenders worldwide. Such attacks often aim to chill free speech and delegitimize the activities of human rights defenders in order to detract from genuine situations of abuse. Following the European Commission’s issuance of its “Interpretive notice on indication of origin of goods from territories occupied by Israel since June 1967” in November 2015, PHROC issued a statement welcoming the EU’s labeling of settlement products while noting that labeling was insufficient. PHROC again affirms that neither labeling requirements issued by states nor the presence of boycott movements initiated by civil society relieve states of their legal obligation to ban Israeli settlement products from entering their domestic markets. Under customary international law and as affirmed by the 2004 advisory opinion of the International Court of Justice, in cases of breaches of peremptory norms of international law, all States are under an obligation not to recognize the situation as lawful, not to render aid or assistance in maintaining the illegal situation, and to actively cooperate to bring violations to an end. If third states do not uphold these and other responsibilities under international law and ensure that Israel is held accountable for its violations of Palestinian human rights, governments should not be surprised if civil society takes peaceful, legal actions to end impunity. Accordingly, states should not prohibit or attempt to limit civil society and human rights defenders from initiating BDS measures against Israel and the corporations and institutions that are implicated in the denial of Palestinian human rights. It is also within the right of corporations and institutions to choose to disengage from activities related to the occupation and/or participate in BDS measures. including by defending against illegitimate attacks against individuals, groups, and institutions involved in BDS, and to hold Israel accountable for its violations of international human rights and international humanitarian law. PHROC further calls on international human rights organizations to stand with the right to engage in boycott, divestment and sanctions against any state, corporation or entity that is violating international law. See Article 41 of the International Law Commission’s Draft Articles on Responsibility for Internationally Wrongful Acts, which reflects customary international law. See also ICJ. 2004. Legal Consequences of the Construction of a Wall in the Occupied Palestinian Territory, para.159. The Court also declared that it is for all States, while respecting the United Nations Charter and international law, to see to it that any impediment, resulting from the construction of the Wall, to the exercise by the Palestinian people of its right to self-determination is brought to an end.